In 1721, the first known inoculation in America took place. It was conducted with the enthusiastic support of a man whose previous passion included finding, interrogating, and —if need be — hanging witches. And the backlash from the Salem Witch Trials made it difficult to convince people that inoculation worked. Cotton Mather is a familiar figure to people who have an acquaintance with colonial American history. Born to the already-famous Increase Mather, he followed in his father’s footsteps as a minister and outspoken moralist. His faith never wavered, though he had his share of misfortunes. His wife and three youngest children all died of smallpox, a disease that broke out in Boston every ten to twenty years, taking bites out of the population and leaving many survivors blind and disfigured. When the minister studied the disease, and talked about it with slaves and servants from Africa, he found that there was a way to lessen its severity. Piercing the skin of an uninfected person with a needle smeared with the pus from a smallpox sore gave patients a mild and survivable case of the disease. Mather and a Boston doctor, Dr. Zebediah Boylston, collaborated in studying the disease—a study that culminated in Boylston inoculating two slaves, a man and a young boy, and Boylston’s son. All survived. It was the first known inoculation conducted in the territory that would become the United States. Mather celebrated this new, divine discovery with a series of pamphlets and letters in local newspapers. He soon learned there was a problem. 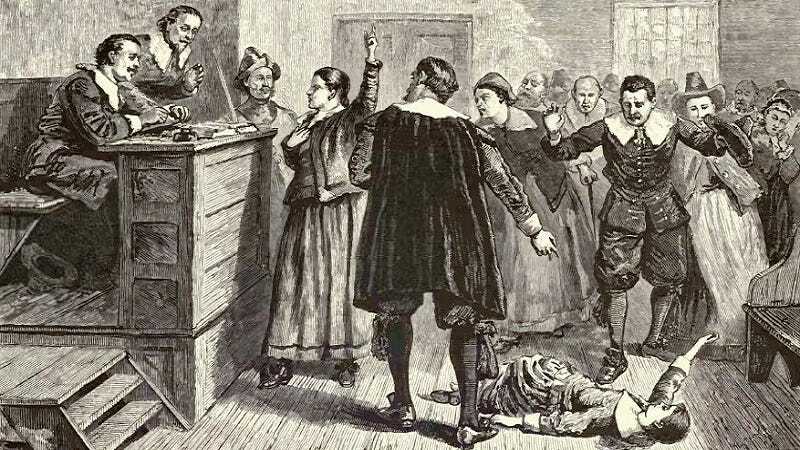 Twenty-eight years before advocating a life-saving medical technique which had been properly tested, Mather had advocated something else: discovering, “testing,” and exposing suspected witches in Salem. The Salem witch trials were a riveting drama that became a disgrace nearly the moment they were over. During the trials, Mather had written to the Salem judges, urging them to uncover the work of Satan and giving them tips on how to test the witches. He’d written publicly about the multitude of devils flying around everyone’s heads. The aftermath of the trials were quiet. Few accusers or judges heard any kind of reproach, probably because almost everyone was guilty of something—if only of enjoying the entertainment. People wanted to forget. However, this new type of technique, which required parents to deliberately expose their precious children to contaminants, proved too much for Mather’s shaky reputation. Mather had his supporters, but he also had a bomb thrown through his window. Inoculation did not make any headway, despite people being desperate for a way to save their families. It’s ironic that when he was confirming the work of the devil in Salem, Mather was for the most part applauded, while when he was confirming the success of a scientific innovation that would eventually eradicate smallpox he was condemned. But the two weren’t unconnected. The scandal of witch trials left him vulnerable to backlash the moment he started saying things that the public didn’t want to hear. And that, for the most part, exactly what happened to the victims of the witch trials.